Women have long had the pleasure, or discomfort, of removing hair from their bodies, but what about men? While women have consistently done so, men’s grooming habits have been scattered over the ages. But there’s been a renewal of manscaping in recent years, as men have realized that they can do so much more with their bodies. Here are four reasons for men to manscape. There’s a certain grace and dignity that men develop as they age. But ear hair and nose hair to not add to that dignity. Nobody wants to see hair coming out someone’s nose. And ear hair just reminds everyone of their grandpa. For younger men entering the prime of their life, it’s important to regularly trim those errant hairs. Thankfully there are now a number of personal groomer tools on the market so that men can add hair trimming to their daily routine. A well-sculpted back is extremely attractive on a guy. Broad shoulders, confidence, but not back hair. Unfortunately, unless someone says something, back hair often goes unnoticed. After all, how many men regularly try to face away from the mirror? The biggest issue with manscaping back hair is that it can’t be done alone. Either a guy will have to ask a friend or partner to help them out, or they will have to book an appointment into a salon. And it’s painfully obvious how hard it is for men to schedule appointments. Still, if you have a partner who’s sprouting some extra hair on their back, you can delicately bring up the subject. Perhaps you’re able to take care of it, or maybe it’s time for a couple’s visit to the salon. Make a date of it and then later show your appreciation for a nice, smooth back. Eyebrows are in at the moment. The trendiest shape of eyebrows has altered dramatically in the last few years. From laser thin eyebrows to more natural, fuller lines, it can be hard to keep up with what is in style. But what is definitely not happening is a unibrow. 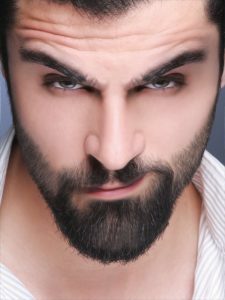 While women have long known to take care of any extra hairs in between their brows, men have opted to either not care or not even notice. Well, men are no longer exempt from eyebrow grooming. It’s best to first start with a professional to see what the desired lines are. There are also many options for eyebrows. From tweezers to waxing to threading, manscaping has never had so many options. There’s no denying that the more effort put into anything, the better it will be. This is especially true when it comes to the bedroom. A little manscape can help surprise your partner in the best of ways.